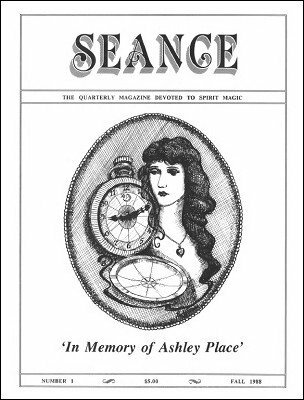 Seance Magazine - a quarterly magazine devoted to spirit magic - was published from fall 1988 until summer of 1991, a total of 12 issues. This is a facsimile reproduction including every published page and every tipped in sheet of advertisement. This magazine is considered one of the best publications on theatrical seances with contributions by legends such as Eugene Burger, Tony Andruzzi, Phil Goldstein (Max Maven), T.A. Waters, Punx, Bob Baker, Lee Earle, Jim Magus, and others, and of course Scott Davis himself. It is a great source for performances during Halloween and other spooky or bizarre performances. IN THE DARK by "Dr. Dees"
1st edition 1988-1991, 226 pages.